What is attractive about Nature Aquarium? We feel beautiful when we see healthy, growing aquatic plants producing many air bubbles during photosynthesis. It is also fun to see fish swimming merrily in an aquascape with lush aquatic plants. Not only the aesthetic appeal that attracts those who see it at a glance, Nature Aquarium also has various invisible attractions. The special feature of this issue discusses in-depth about the attractiveness of Nature Aquarium and know-how on creation of beautiful aquascape in a Q&A style. What are the differences between Nature Aquarium and other layout styles? Nature Aquarium has the fundamental concept of “Learn from Nature”. 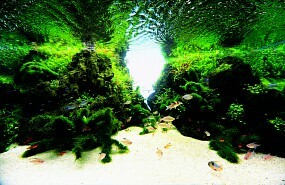 It means the incorporation of natural ecosystem and beautiful landscape into an aquarium. As can be seen from this, Nature Aquarium intentionally creates a conducive environment for fish as an “aquascape” and this is something different from other layout styles. Nature Aquarium is a world within an aquarium where fish, aquatic plants and microorganisms interact and coexist in mutual prosperity; and it is an aquarium hobby which connects people and natural environment. Why is CO2 supply necessary for Nature Aquarium? By promoting photosynthesis, aquatic plants grow faster and the environment in the aquarium becomes better. 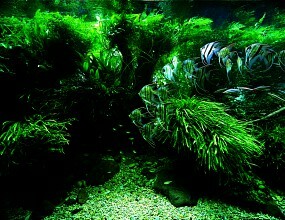 Aquatic plants take in CO2 and in turn, produce a lot of oxygen through photosynthesis. Since oxygen is used by fish, shrimp and microorganisms for breathing, the environment with more oxygen is better for living organisms and the water quality will be stable as filter bacteria become active. 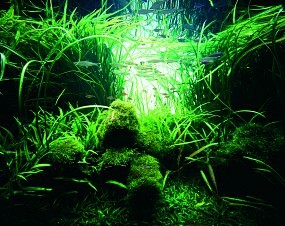 Appropriate amount of CO2 supply is effective to maintain the ecosystem in the aquarium in good condition. How long can we maintain the layout? A Nature Aquarium created based on the concept of long-term maintenance can be maintained for years or even more than a decade. 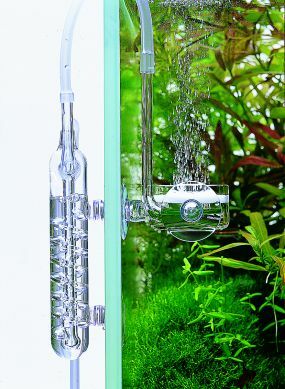 To maintain Nature Aquarium for a long period of time, appropriate maintenance work is crucial. The layout is maintained as well as trimming and replanting. If a part of Aqua Soil is replaced with new one during this trimming and replanting process, healthy growth of aquatic plants can be maintained. Other effective approaches to achieve long-term maintenance of layout include making use of slow-growing shade plants such as ferns and Anubias and the use of cosmetic sand or ADA Aqua Gravel as the substrate material for the foreground portion of aquarium. It is also important to install a filter with a capacity slightly more than the adequate capacity.